In my ongoing Design Interactions Master my classmates and me recently had the opportunity to do an industry project in cooperation with Intel. We were asked to research, analyse, prototype, test and realize new perspectives and directions for Social Computing. The term Social Computing is very fuzzy, but refers in a general sense to the intersection between social behaviour and computational systems. According to this, pretty everything which is related to human interaction, society and culture then somehow relates to social computing. So you could imagine that the beginning of my research was quite meandering, the scope of this topic is just huge. 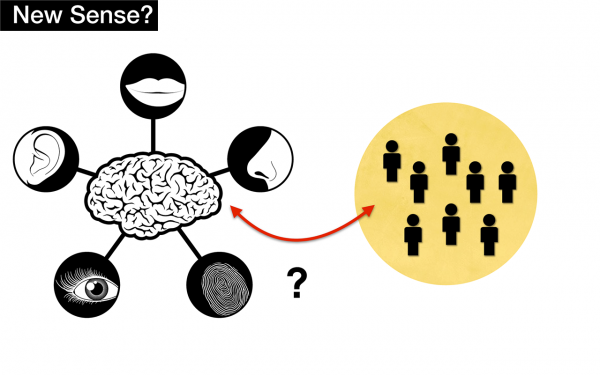 Is it possible to create a new human sense for social computing? What if humans could have a sensation of location based social data? I was really interested in experiencing this “new” sensation personally, so I decided not to speculate too far in the future (in terms of “we all gonna have soon chip implants in our brain”). Instead I focused in augmenting and enriching our exiting senses with an additional social computing data layer. After quite a lot of attempts, the Crime Sounds App was my final proposal to illustrate the idea. Crime Sounds gives you a sense of crime around your current location by enhancing your hearing with a cinematic “soundscape”. 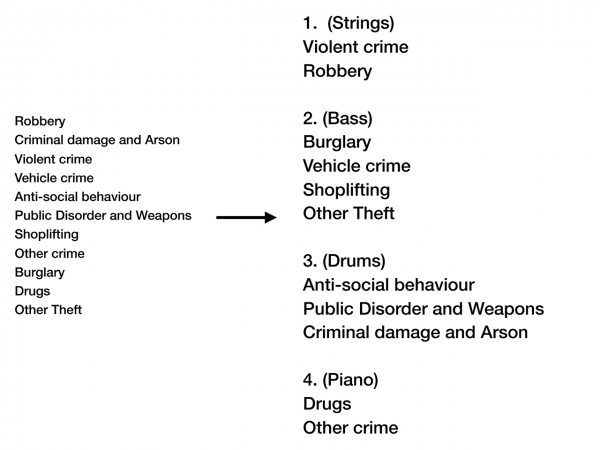 Or, to put it in other words, Crime Sounds is literally a Sonification of the crime database published by the UK Police forces for England and Wales. All crimes within a range of 50 meters are used to generate a soundtrack (the app loads on startup all data in a distance of 750 meters). The volume of four different instruments is controlled by the category and the amount of the crimes within the close range, all other crimes are muted. Because there are 11 crime categories in the database, which is a bit too much for an easy audible differentiation, the categories are grouped from worst to bad into 4 groups, one for each instrument. To get an impression what’s going on if you walk around in the city with crime sounds, the video below shows my test run around the RCA in South Kensington in London. After wandering around some time in London with my new social sense, I had the feeling such a sense could have interesting or maybe even serious implications. 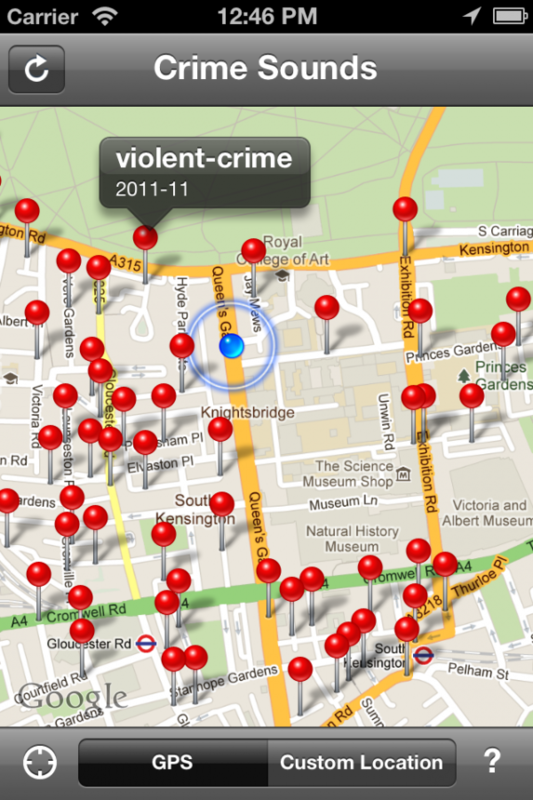 The experience of specific location changes dramatically if you have an ad-hoc sense of threat and crime. I suppose that I probably wouldn’t rent a house if I had been welcomed with a crime sound. Or I thought a few times twice whether it’s really a good idea to walk further at night in some streets … The video illustrates the scenario. Many thanks to my friends at 47 Nord for publishing the app!